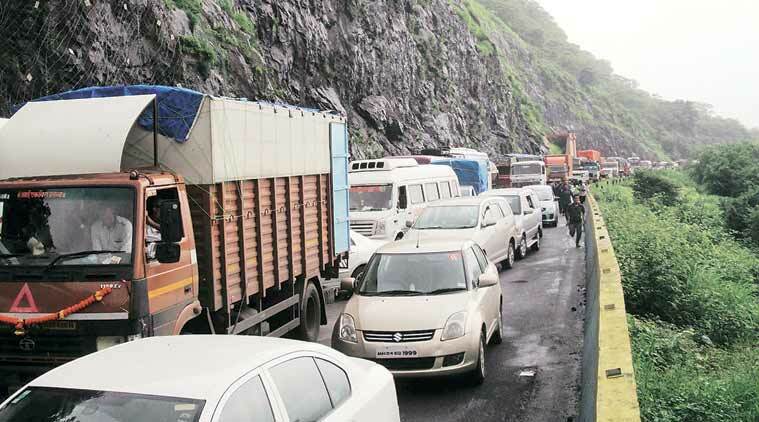 Two persons were killed and three injured after three vehicles were hit by falling boulders in the landslide that occurred near Adoshi tunnel at Khopoli on Pune-Mumbai Expressway, around 70 km from Pune city, Sunday afternoon. Following the landslide, traffic on both lanes of the expressway had to be halted for hours, leading to a long jam. The government has announced a compensation of Rs 4 lakh to families of the victims. According to Khopoli police, around 12 noon, boulders and rocks rolled from the carved mountain along with the wet soil on the expressway following incessant rains, blocking lanes on both sides of the expressway. Three vehicles, two cars and a trailer, were trapped under the debris, severely injuring five persons from the two cars. Two of the five injured succumbed to their injuries on way to the hospital. Police have identified the deceased as Dilip Gopal Patel (52) and Shashikant Dhamankar and the injured as Mangal Mane (35), Sushila Dhamankar (60) and Nirmala Patel. The injured are being treated at Lokmanya Hospital at Nigdi. Police said the Patil family was on their way to Pune to drop Dilip’s daughter Beena to a hostel in Pune for her first day of college. Police said due to the jam, it took the personnel from the IRB (the company which has been awarded the contract of maintenance of the Expressway) over an hour to reach the spot with the earth-moving equipment. Local police and personnel from State Highway Police started removing the debris immediately after the incident. After an hour, the IRB personnel too joined in. PWD minister Eknath Shinde said he had spoken to Chief Minister Devendra Fadnavis about the issue and announced that the government would bear all medical expenses of those injured in the accident.